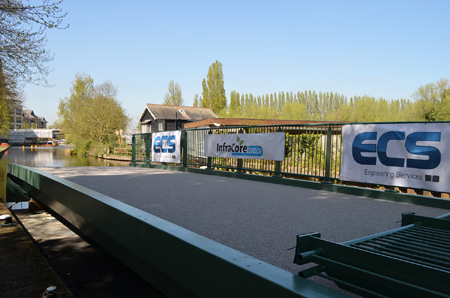 Commissioned by the UK Environment Agency to design, supply and install a new bridge for the Mapledurham Lock, 6km northwest of Reading, ECS has installed an innovative composite material bridge with a 50-year guarantee. The objectives of the project were two-fold. 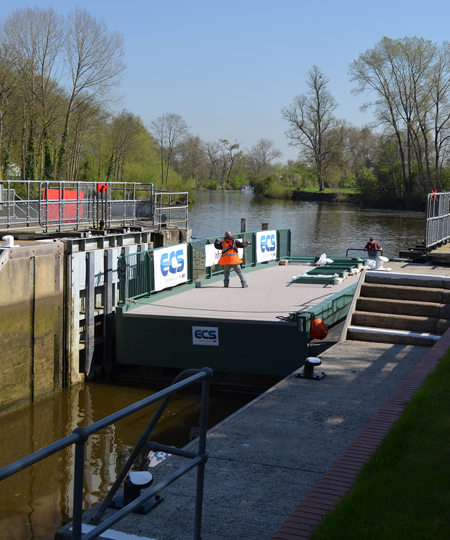 Firstly, as part of a refurbishment programme taking place across a number of sites on the River Thames, the project aimed to improve the capacity of local access routes to the Mapledurham weir and lock complex in Purley-on-Thames village. Secondly, the project sought to upgrade the size and strength of the existing bridge structure, which had insufficient capacity for modern vehicles. The solution had to take account of the remoteness of the site’s location, the limited vehicle access and the short timeframes required for installation. To meet these challenges ECS turned to bridge construction technology invented by Fibrecore Europe. Fibrecore uses fibre-reinforced polymer (FRP) to build complete bridge structures at its plant in Holland. 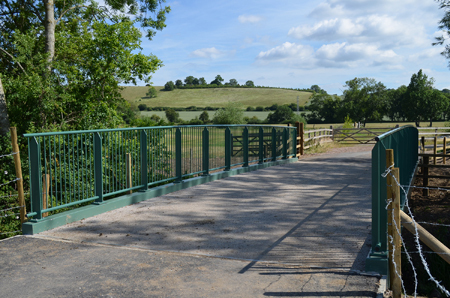 Mapledurham’s 13m-bridge deck was moulded in a single piece with an integrated bonded anti-slip surface. 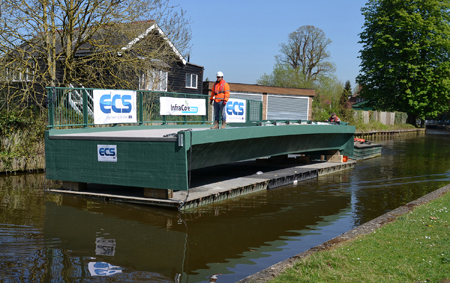 According to ECS, custom-manufactured FRP decks have the most efficient combination of strength and stiffness for a particular bridge’s span and loading (in this case 60t). This results in FRP bridge decks that are around a third of the weight of steel or concrete equivalents, offering savings on civil engineering and installation costs. Restrictions to the Mapledurham site meant that the bridge couldn’t be transported via truck and that access for large vehicles, such as the lifting cranes to place the bridge into position, required their own separate set of considerations. Consequently ECS had to create a 350m temporary road to enable access for heavy cranes of up to 90t capacity to facilitate the final stages of the bridge installation. The use of the lightweight Infracore FRP deck meant that the bridge could be delivered to the site on a barge. The installation itself was, according to ECS, relatively straightforward, with site preparation taking up a large proportion of the build time. The old bridge had to be demolished, new foundations piled and finally new concrete caps cast around them. With the foundation work completed the new bridge was installed in a single day. The new bridge has provided the Environment Agency with greatly improved access to the weir and lock complex, which in turn has allowed additional vital maintenance work in the area to be completed. It is estimated that the new structure will last for 100 years with little or no maintenance.